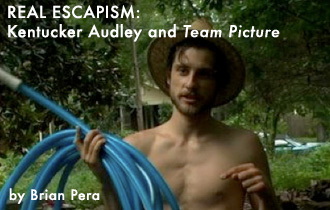 Brian Pera reviews Ketucker Audley’s Team Picture, which started gaining attention at last year’s Memphis Film Festival. Since then it has been featured in New Talkies: the DIY Generation series at IFC, and film scholar Ray Carney included it as part of Independent’s Week: New Independent Cinema 2007 at the Harvard Archives. Team Picture has been embraced by – yet stands apart from – the current laissez-faire Youtube genre trend "mumblecore." Pera argues that Audley wields a unique style that bridges somewhere between the verité of a Cassavettes or Antonioni – the scenes slow and thoughtful, the directing more slight-handed than sleight of hand, and the final product beautiful and with purpose. Brian Pera reviews two new books: Wayne Koestenbaum’s Hotel Theory, a visually experimental work which juxtaposes two seemingly disparate texts, a collusion of dead stars and theory and into one cohesive package, and Masha Tupitsyn’s Beauty Talk & Monsters, a collection of observations, "Disguised as a series of short stories," of women seeking "apartness-as-refuge."